Summer has arrived. Summer this year is gifting me with the opportunity to teach my young son how to take care of his clothes. We already have two steps accomplished. We have donated outgrown clothing and incorporated a plan to have clothes chosen for the week and lined up nicely in his closet. It is working out great! 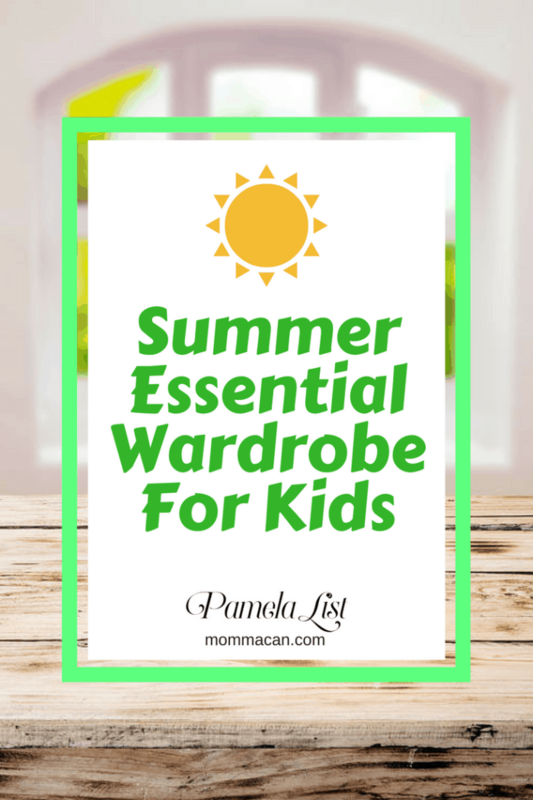 To replace the outgrown clothing, I scoured my brain, my friends’ minds and (hold your breath) my mother’s brain to decide exactly how much clothing a school-aged child needs for the summer. If children have too little of clothing pieces parents, end up scrambling in the dirty clothes hamper for something semi-clean to wear in a pinch. If children have too many clothing pieces, then there is no way parents are going to be able to teach their children how to organize and store the clothes neatly. Adjust your list to suit your child’s needs. So to keep a long story short below are listed summer essentials. You may need to adjust a couple for many reasons. There is a summer wedding that the family plans to attend or some other formal affair. You are traveling to a place that for some crazy reason requires snow gear. Adjust your needs accordingly but make sure each component has a place in your child’s closet that is easy to reach for storage. Lightweight windbreaker jacket – preferably water-resistant with a hidden built-in hood. Shorts- around seven pair, cargo, tailored khaki for golfing or nice luncheon, sports shorts for playing ball with the guys. For girls, the sky is the limit, but please remember they are little girls and try to keep the behinds covered as much as you can. There will be plenty of time in their twenties to show off whatever it is they have to show off. Just one pair or two if they are swimming several times a week. Girls – I am not going to say much here, I am a bit old-fashioned. But for swimming lessons a one piece is essential. Surf Shirt For the younger ones a surf shirt is excellent. Some actually can protect the skin from a sunburn or so they claim. Hats: Boys do love their ball caps, you only need one or two. But these at around age five suddenly become collector items. Be prepared to start discovering unique ways to store their collection. Girls: Users choice, but just make sure the ones worn in the sun have really good coverage. Undershirts and Socks – 10 each and two pair of black dress socks if needed for boys. Girls: One slip and if your little one is an early bloomer a couple of training bras. Now, don’t get all crazy I am speaking of the 10-year-old here. Pants – 5 pair maybe three if you live in a really hot climate. I live in California; it is usually always cool in the summer nights. Best color choices for boys navy blue and khaki. Best color choices for girls: grab the nearest crayon box…. the sky is the limit. Jeans – 5 pair, I love little boy jean with an adjustable waist that is pre-washed. The Kid Gap is a great choice to find jeans. Sweaters/ Sweatshirts – For summer two or three will do. We usually keep these pretty casual and always have at least one hooded sweatshirt for unexpected chilly nights. It is also nice to keep a sweater or sweatshirt in each car just in case. For girls – a white lightweight cardigan is very versatile and can go with summer dresses or any other outfit within reason. It would not hurt to have around three of these in different colors. Remember we are trying to teach responsibility here. If your child has 75 t-shirts, they will never be able to store them quickly and properly. Boys should have at least one collared shirt for church, special dinners or luncheons. Blouses for the girls: 5 and one should be white for versatility. Skirts and Casual Dresses for Girls – 7- 12 ( shopping anyone?) and matching tights when appropriate. Raincoat – just one and good luck finding those if you live in Southern California. Athletic shoes – For running and playing sports or just playing in general. Waterproof sandals or water-resistant sandals: for the beach, pool time or just general water play. I would not wear these all the time; they do not come with good support. Dress shoes – For boys only as needed. For the girls, well it depends on you closet space and your budget. Just make sure she can tidy them up in very little time. Remember, we are teaching responsibility here. And that is it! Yeah, I thought this post would never end! I cannot tell you how freeing it will be for you children to be able to find the clothes they need and to be responsible enough to put away their items quickly and correctly. Now, I am off to purge a bit more in Little Guy’s Closet and write down what items we need and give away what items we don’t. If you have any other items to suggest for this list, please email me at momma@mommacan.com, and I may add them or just comment in the comment section. Our lists are very close. Living here in the south we tend to live in shorts from May to October though, not even looking at jeans or long pants unless there is a special occasion. With evenings in the 80’s jackets are not needed outside but rather inside with air-conditioning. I would have to up the number of bathing suits for both girls and boys to a minimum of 2 -3. We are big swimmers here, sometimes twice a day. Rash Guards are an absolute necessity, they really do keep us all from getting burned. My trick to keeping little girls modest in dresses and skirts was to have them wear bike shorts under them. They come in all sorts of cute colors and coordinate with the dresses. I am very blessed to have one child old enough to handle all of this herself. She brings bags of clothes down all the time to donate. And I think, where on earth did you get that many things! Anita, that makes you a very blessed momma for sure!